The automated Invitation round data for Skill Select programme has announced on 11th September 2018. Read the below information to accurately understand the nature of selection against the point test criteria set by Immigration Department of Australia. 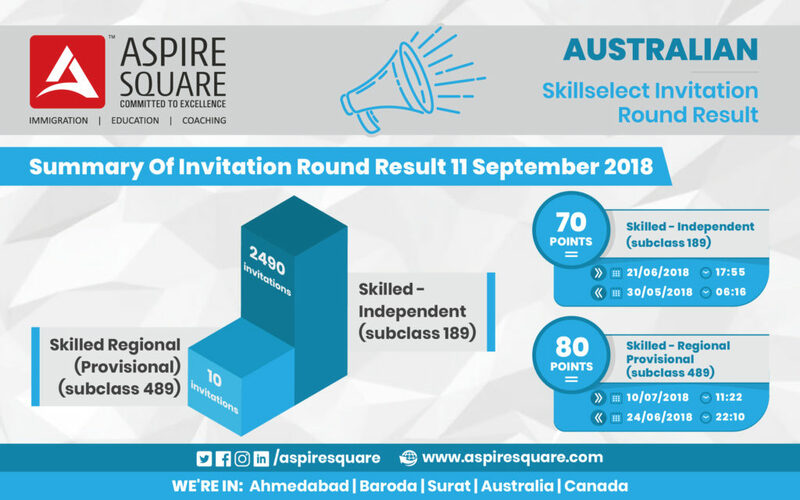 Being Australian Immigration Specialist in Gujarat, Aspire Square always endeavours to supply you the detailed information on the Invitation round of Skill Select. Department has issued “2490” Invitation for Skilled Independent Visa – 189. The cut off points for visa subclass 189 has remained same as per the last Invitation round with date of effect 21/06/2018, We can consider the increment of date of effect is almost 21 days. The cut off points for visa subclass 489 is 80 and has remained same as per the previous Invitation round with date of effect, which is 10/07/2018. In certain terms of date increment is almost 16 days. See below image for more detail. In pro-rata occupations almost, all occupations cut off points remain same, only Electronics Engineer (2334) has dropped the cut off points by 5 which is now at 70. Please notice: The date of effect has changed from 19/07/2018 to 15/11/2017. Candidates with higher points score are invited to apply for the relevant visa. For clients who have equal point’s scores, the time at which they reached their points score for that subclass referred to as the visa date of effect determines their order of invitation. Candidates who have lodged their EOI earlier as compared to those who have missed out on dates i.e., later dates. If you wish to compare your Expression of Interest (EOI) against the outcomes of the invitation round, you can check your points score and visa date of effect at any time for all visa subclasses covered by your EOI on the home page of SkillSelect EOI. The images above will reveal the Invitation round policy. We at Aspire Square always believe to give the right Immigration advice & best services for your Migration needs. Australia is always known for the best economy and stands as priority for many candidates. 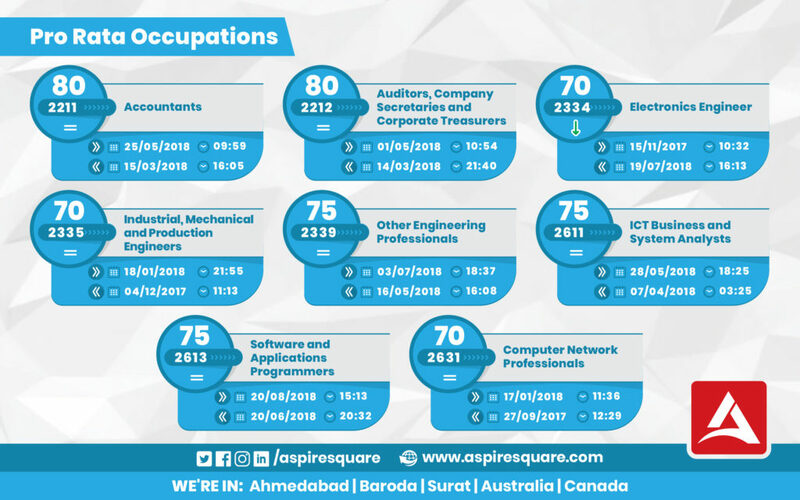 Aspire Square has presence in Ahmedabad, Surat, Baroda, Australia and Canada ; Being Expert Immigration Agent in Gujarat, We do not compromise on gaining the in-depth knowledge of Australian Immigration process as we know the responsibility for making our Client’s dream successful. Email your resume on inquiry@aspiresquare.com or Call us on +91 88668 80707 for more detail.